Devotional songs have always been an important part of the heritage of oDiA music. Whether it is the bylanes of villages or towns, temples or in houses, people communicate with the Supreme Being through these Bhakti rasa songs. The Lord is worshipped at the commencement of every venture a devoted Hindu undertakes, whether it is a household duty, a religious worship, an academic pursuit, or a business adventure. At such a juncture, AP Arts International LLC, true to its goal of preserving the dignity of odia music comes forth with its new gift for you, ARADHANA. We have for you eight melodious bhajans composed by a distinguished personality of the world of odia music, Shri Basudeb Rath. The right balance between the lyrics and melody has made this collection a must-have for all music lovers. Harmonizing all subtleties and nuances of the Bhakti rasa, the songs are sprinkled with spiritual insight and inspiring. Whether it is an imploring”Chaka Akhi Tume Eka Mora Sakhi “, or ” Niti Kaha Pain Karuacha Sain “, tugging at the heartstrings, the songs speak about fundamental spiritual truths in simple terms. The CD has been produced by Suresh Behera of North Carolina, USA under supervision and guidance of Dept of Odia Music, AP Info Arts Pvt Ltd, Rourkela. Those who love to sing bhajan and bhakti geeta can also avail the KARAOKE TRACKS of this album shortly. 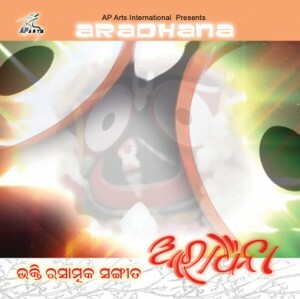 Really its fantastic.This is a sweet collection.I like it verymuch.”ARADHANA” truly touches the heart & mind of Odias.I hope every Odia appreciate it. Really it’s nice very very …..thanks of this team members. will be more popular if u add new adhunika album in your site. thanks all improve u r site. This is fantastic oriya collection portal. Any person can access this site at any time and any where. The songs posted by you are very fabulous. If the Title “SITA NUHANTI KALUSITA” will be posted in the GEETINATYA section then it will be intersting. Really it is a marvolous collection by you. I have no words to express my feeling towards your dedicted contribution for oriya. I am very much thankful to yo. It is a wonderful deeds for us to proudly say as we are oriyas. First of all I want to congratulate you as a oriya something doing for orissa people.I am staying in Bangalore,if you have any distributor in bangalore kindly give me that address. You Have any shop in New-Delhi.please get me the shop addrees. Your strive in this regard is highly appreciable. It is an amazing step for Oriya People as well as Oriya Language.